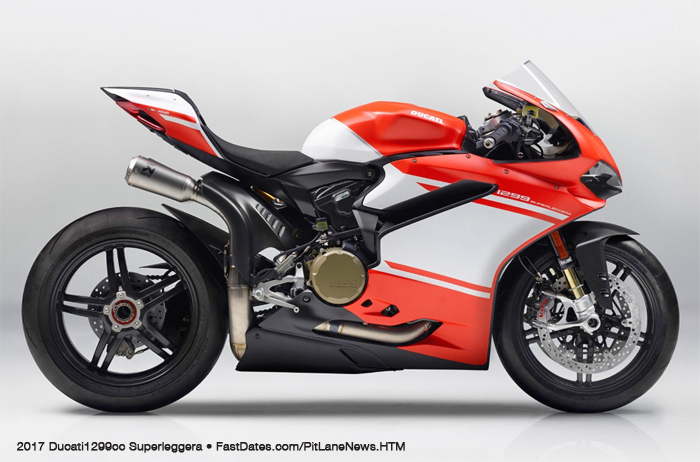 Ducati Corse factory rider Chaz Davies' Panigale 1199RS15 World Superbike. • Sunday October 15th 2017 Rider Roundup at The Ranch in Agoura, CA. 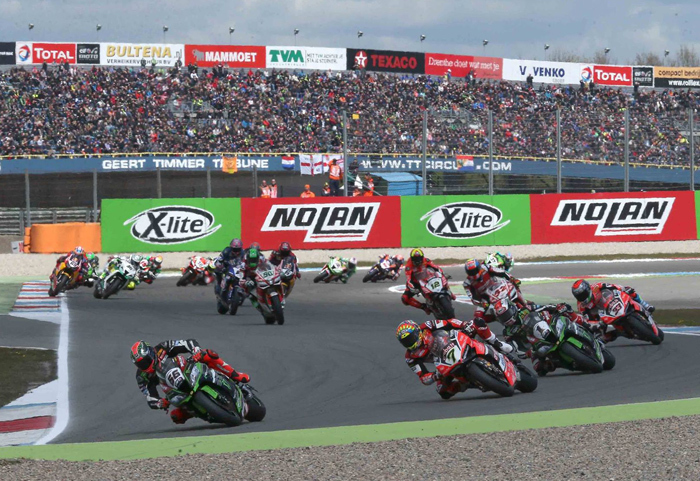 The Netherlands, April 28-30th 2017 - A 1-2 finish from KRT Riders Jonathan Rea and Tom Sykes in the second Superbike World Championship race of the Assen weekend provided great drama in the final chicane, with Sykes closing in to within 0.025 seconds of victory but Rea holding on to secure another double Dutch success. The classic TT Circuit at Assen provided an ideal backdrop for Rea to start the 200th WorldSBK race of his career and he duly took away his seventh race victory of 2017, his 11th at Assen since he started his WorldSBK career and his third double at this 4.542km circuit since he joined Kawasaki in 2015. It was an important day of statistics for Rea, as he also secured his 45th career win in WorldSBK and his 30th individual race win for Kawasaki. Tom Sykes and his crew worked to improve his machine set-up overnight and he almost took his first race win of the year as a reward, only losing out on a last chicane attack on Rea by 0.025 seconds across the line after 21 intense laps. Battling the high winds today like all his peers, Tom duly overcame his continuing physical issues to record two second places at Assen this weekend, making it six podiums from the eight races held so far this season. In the championship Rea now leads by 64 points, from his team-mate Sykes, with Chaz Davies third on 111 points and second race faller Marco Melandri on 97. Chaz Dazies and Jonthan Rea agree to disagree as Chaz complained that Jonthan blocked his Superpole run on Saturday morning. The race stewards agreed and bumped Jonthan from his winning Pole time to 4th on the grid for the start of Race One. It hardly mattered to the 2-time Champ who would go on 2 win both days races from Rows 2 and 3 for this weekend. 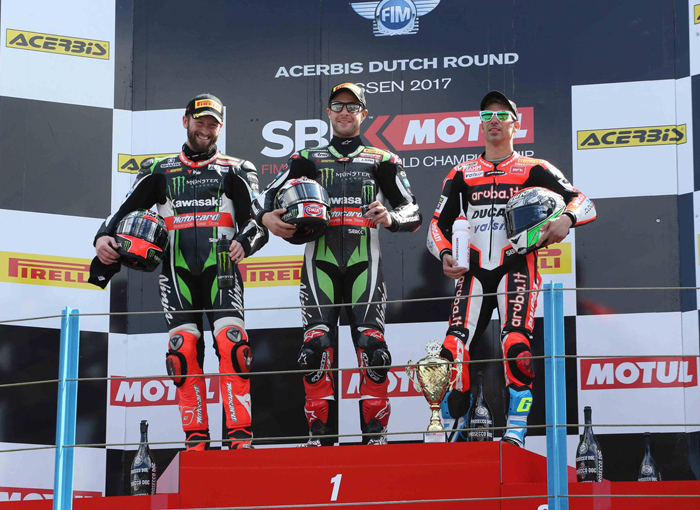 Race One, Saturday May 29th - Jonathan Rea (Kawasaki Racing Team) took a clear victory in Race 1 at the Acerbis Dutch Round on Saturday, after a long battle with Chaz Davies (Aruba.it Racing - Ducati) ended in a frustrating DNF for the Welshman who pulled up at the end of the penultimate lap. Tom Sykes (Kawasaki Racing Team) crossed the line in second place, ahead of Marco Melandri (Aruba.it Racing - Ducati) who completed the rostrum places. There was frustration for Michael van der Mark (Pata Yamaha Official WorldSBK Team) who ran long on the first corner and then crashed out of his home race at turn 5 early on. That was before his teammate Alex Lowes went down at turn 10 midrace to make it a difficult day for Yamaha. Jordi Torres (Althea BMW Racing Team) and Riccardo Russo (Guandalini Racing) were both unable to finish due to technical problems. 1st - Jonathan Rea (Kawasaki Racing Team) - “I’m really happy, I’ve had so many questions over the weekend asking why I’ve won so many here and I don’t know why. 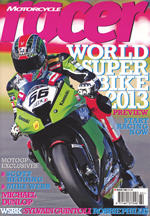 It’s just a circuit I really like, it suits my riding style a bit and to make it happen here again is great." 2nd - Tom Sykes (Kawasaki Racing Team)- "I am happy with today considering where I was on Tuesday afternoon, to be second here to Jonathan is not too bad - OK I was gifted it but I had some limitations today. I think tomorrow we need to improve, overall we're collecting as many points as we can and were close to a good set-up." 3rd - Marco Melandri (Aruba.it Racing - Ducati)- "For sure the podium here was impossible to get until this morning and my speed this morning was not good enough for top five, but then in Superpole and the feeling was back, and then in the beginning of the lap my pace was ok but not enough to stay with the front guys. Fourth for me was ok here in Assen." RACE TWO, Sunday May 30th -In pleasant sunny conditions at the TT Assen Circuit on Sunday Jonathan Rea (Kawasaki Racing Team) gave a superb demonstration of his talent with a tight victory over second placed teammate Tom Sykes, as Chaz Davies (Aruba.it Racing - Ducati) completed the podium in third. 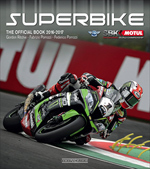 In his 200th WorldSBK race Rea held his nerve to cross the line 0.025s ahead of Sykes as the Yorkshireman applied the pressure in the final stages. 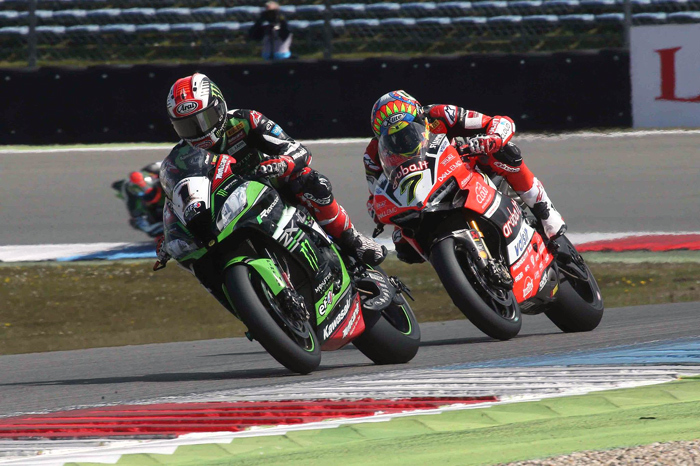 It was Rea’s second win of the weekend, his seventh victory from eight races so far in 2017 and his 11th career win at Assen – with maximum points from Round 4 in the Netherlands putting the KRT man 64 points clear at the head of the standings. It was a valiant effort for Sykes after his recent health issues and he will aim for his first win of 2017 next time out, in two weeks time at Imola. After his cruel luck on Saturday, which saw Davies pull up with a technical problem with a lap to go when fighting for victory in Race 1, the Welshman bounced back with a fifth podium result of 2017 so far, in third place. A good ride by Michael van der Mark (Pata Yamaha Official WorldSBK Team) at his home round saw the Dutchman recover from a crash on Saturday to register a solid fourth place finish from 11th on the grid. It might have been even better for Van der Mark but for a big wobble for the Yamaha rider at turn 12 midrace -when he was chasing Davies for third. Van der Mark’s Yamaha colleague Alex Lowes (Pata Yamaha Official WorldSBK Team) also made up for his Race 1 disappointment to finish in the top five again, after crashing out on Saturday. Another Englishman Leon Camier ( #2 MV Agusta Reparto Corse) rode well for sixth, finishing just over a second ahead of Spaniard Jordi Torres (Althea BMW Racing Team). 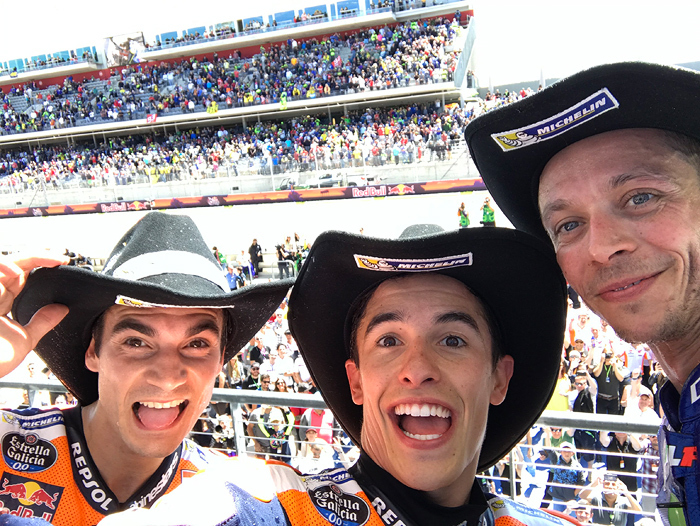 The top ten was completed by Eugene Laverty ( #50 Milwaukee Aprilia), Nicky Hayden (Red Bull Honda World Superbike Team) and Stefan Bradl (Red Bull Honda World Superbike Team). There were crashes for Italian trio Lorenzo Savadori (Milwaukee Aprilia), Marco Melandri (Aruba.it Racing - Ducati) and Riccardo Russo (Guandalini Racing) meaning no points for any of them. 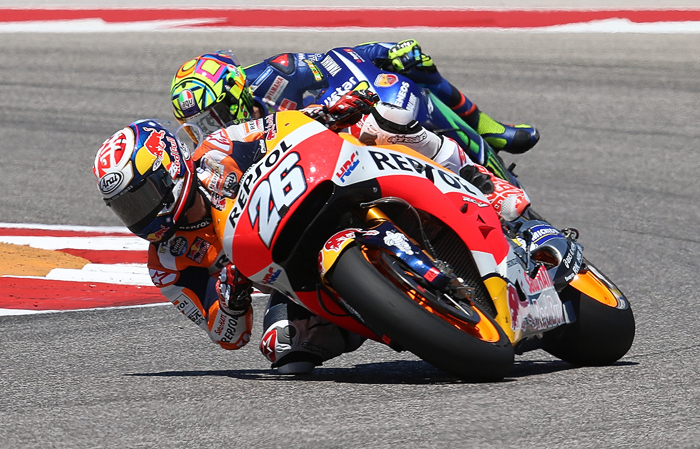 They will each have a chance to make amends at their home round in Italy at Imola in two weeks’ time. 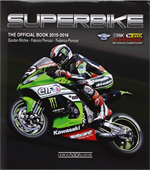 1st - Jonathan Rea (Kawasaki Racing Team)- "It has been an incredible weekend of racing, of course the race wins were really nice to take away. Today was a race of two halves, in the first half I raced hard until I got a warning so in the second half I just managed things to try and be safe and bring her home." 2nd - Tom Sykes (Kawasaki Racing Team) - "It was a very close finish and I have to say thanks to my publish, my fans and all the team for being very understanding about my physical condition. Today I felt we had a package capable of winning. I always kept trying and I am obviously disappointed not to take the win." "It was tough, I enjoyed the racing, thay was good but in terms of how my race went I can't say I'm happy with it, I didn't get the bike that I wanted so prrhaps we went the wrong way with the set-up and we struggled to get the feeling with the bike that I like. 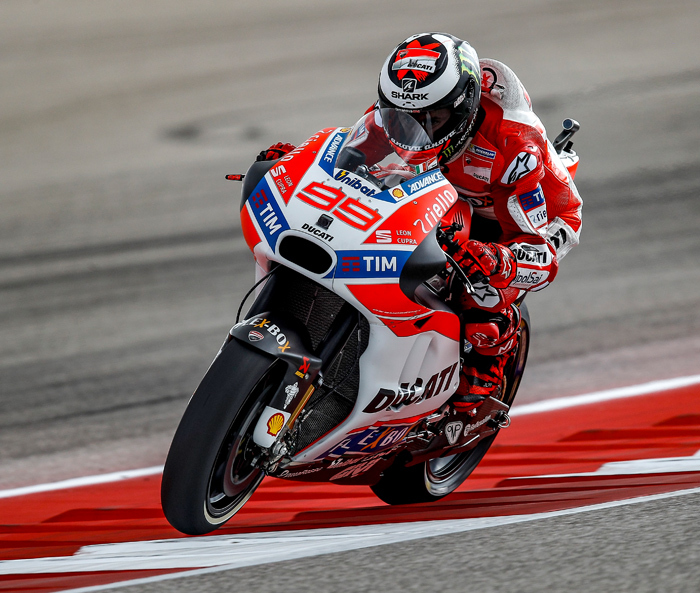 We move onto Imola, Ducati's backyard where hopefully we can be faster." 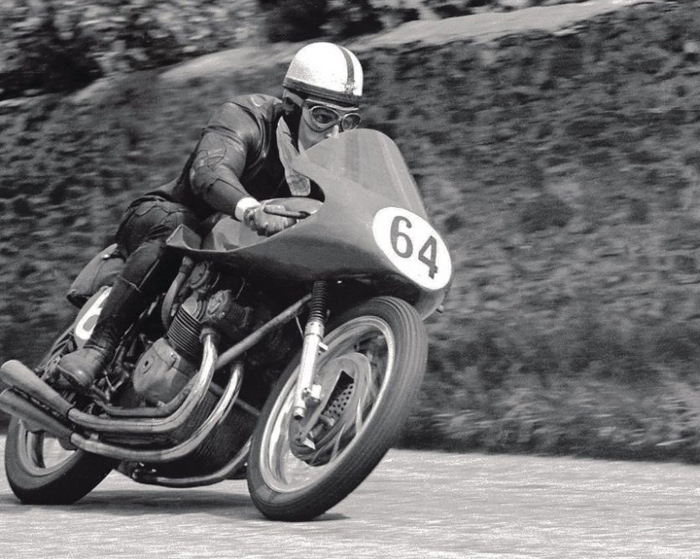 John Surtees was World GP Champion for MV Agusta in 1956 and '58-60, the Formula One World Champion in 1964. It can be hard to give what feels like adequate respect to someone you’ve never known personally, and especially so when that person is as towering and well-known a figure as John Surtees. 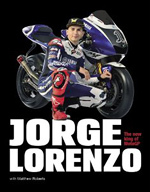 Last week the world of motorsport and the world at large lost a special person. Surtees was 83 years old when he died in hospital on March 10th 2017, and leaves behind a legacy during those years that’s full of impressive feats of motorsport as a rider, driver, and manager. Surtees, the only person to have become a world champion on two and four wheels, began an illustrious career of racing on a motorcycle, winning his first 500cc World Championship riding an MV Agusta in 1956. A short time later, he would go on to win back-to-back-to-back championships from ’58-’60, kicking off a string of unbroken wins for the Italian motorcycle manufacturer that would stretch for 17 seasons of dominance. 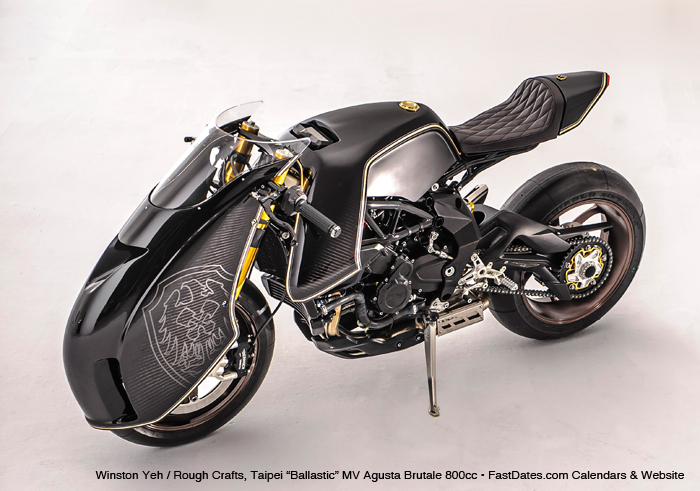 To add to his impressive list of moto accomplishments, Surtees also made an indelible mark on the Isle of Man Tourist Trophy as the first person to win the Senior TT (not referring in any way to age, think of this as the bikes in this category being the big brothers of the slower TTs) 3 times in a row. On 25 September 1965, Surtees had a life-threatening accident at the Mosport Circuit (Ontario, Canada) while practising in a Lola T70 sports racing car. A front upright casting had broken. A.J. Baime in his book Go Like Hell says Surtees came out of the crash with one side of his body four inches shorter than the other. Doctors set most of the breaks nonsurgically, in part by physically stretching his shattered body until the right-left discrepancy was under an inch – and there it stayed. The 1966 season saw the introduction of new, larger 3-litre engines to Formula One. Surtees's debut with Ferrari's new F1 car was at the 1966 BRDC International Trophy at Silverstone, where he qualified and finished a close second behind Jack Brabham's 3-litre Brabham BT19. A few weeks later, Surtees led the Monaco Grand Prix, pulling away from Jackie Stewart's 2-litre BRM on the straights, before the engine failed. A fortnight later Surtees survived the first lap rainstorm which eliminated half the field and won the Belgian Grand Prix. John Surtees had that rare quality that allowed him to speak his mind candidly while still managing to remain endearing, and the even rarer one that saw his actions follow in accordance with his words. So, following disagreements with Ferrari surrounding the 1966 24 Hours of Le Mans, Surtees left the team, and, of course, went on to handily win the Can-Am season in its first year of running, 1966. Clearly his prowess behind the wheel was undeterred by a change in scenery. Following a career dotted with championships, Surtees left the driver’s seat and underwent the arduous tribulations of team ownership with the creation and management of his Surtees Racing Organization. Leading efforts in Formula 1, Formula 2, and Formula 5000, Surtees was dedicated to, and remained heavily involved in competitive international racing. After the last of his teams closed up in 1978, Surtees still did not abandon the racing world, as he continued in vintage motorcycle and car racing events for much of his life. 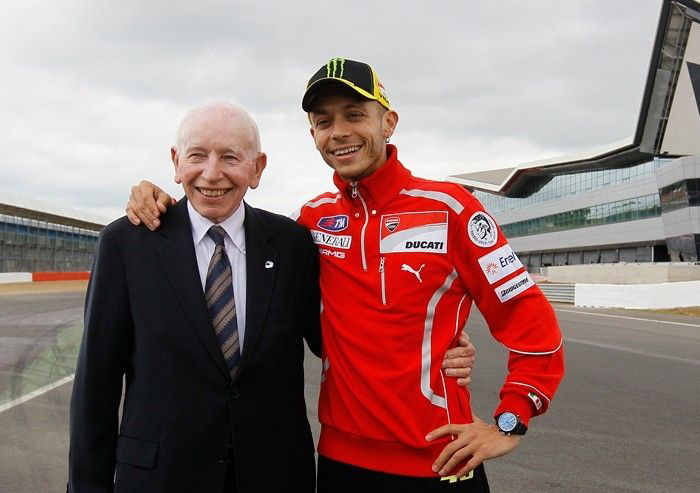 John Surtees at the new Silverstone a few years ago with fellow World Champion Valentino Rossi. 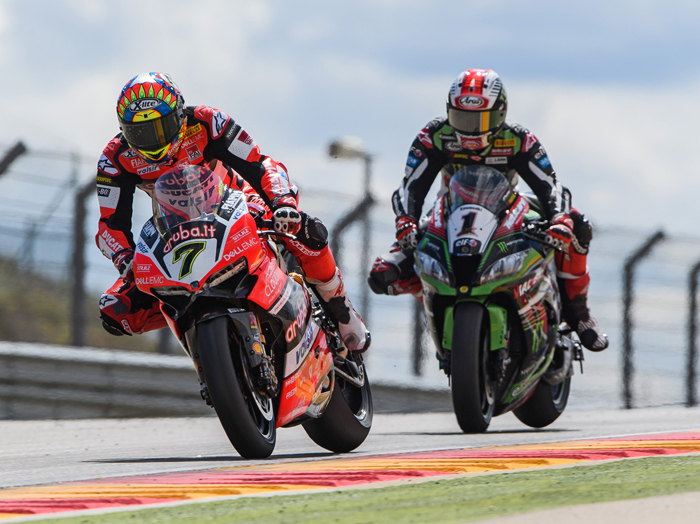 Chaz Davies (7) and Jonthan Re (1) battled for the win in bith races at Aragon. 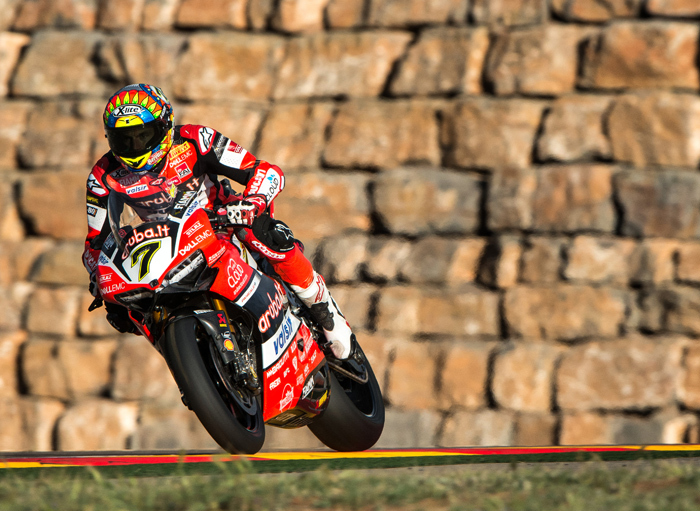 Aragon, Motorland, April 1st-2nd 2017 -Ducati team took its first win of the season in Race 2 of the 2017 WorldSBK Championship at Aragon (Spain) thanks to a brilliant performance by Chaz Davies. The Welshman bounced back from a crash while leading Saturday's Race One over Kawasaki's Jonthan Rea, with Davies winning Race Two on Sunday and claiming his sixth victory at the Spanish track and 21st of his career. After finishing second yesterday, Marco Melandri took third place at the end of particularly close race, in which he fought for the win until a couple of laps to go. Starting in tenth and eighth position respectively, Davies and Melandri quickly stormed back through the field, already joining the leading group on lap 3. The two teammates then closely followed Rea until lap 12, when Davies took the lead. The final laps resulted in a spectacular series of passes. 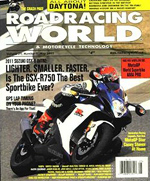 Melandri climbed to second position but eventually had to drop his pace to avoid taking too many risks. Davies on the other hand crossed lines with Rea several times, only to make the decisive move at the last chicane. After three rounds, Davies (95 points) and Melandri (81 points) are respectively second and fourth in the championship. 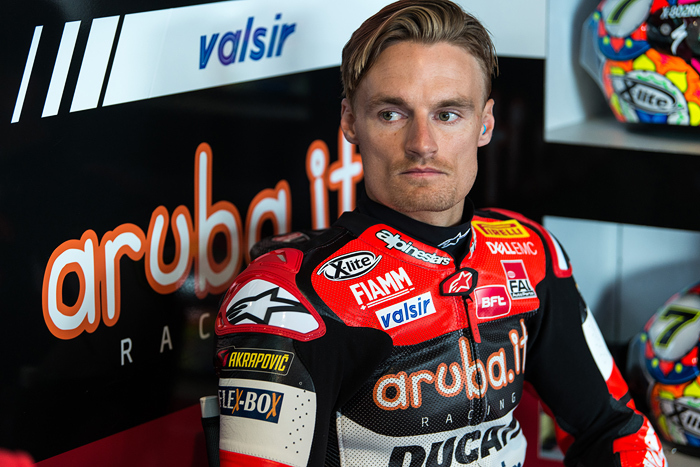 The Aruba.it Racing - Ducati team will resume action tomorrow for a one-day, official test ahead of the fourth round of the season, scheduled for April 28-30 in Assen (Holland). 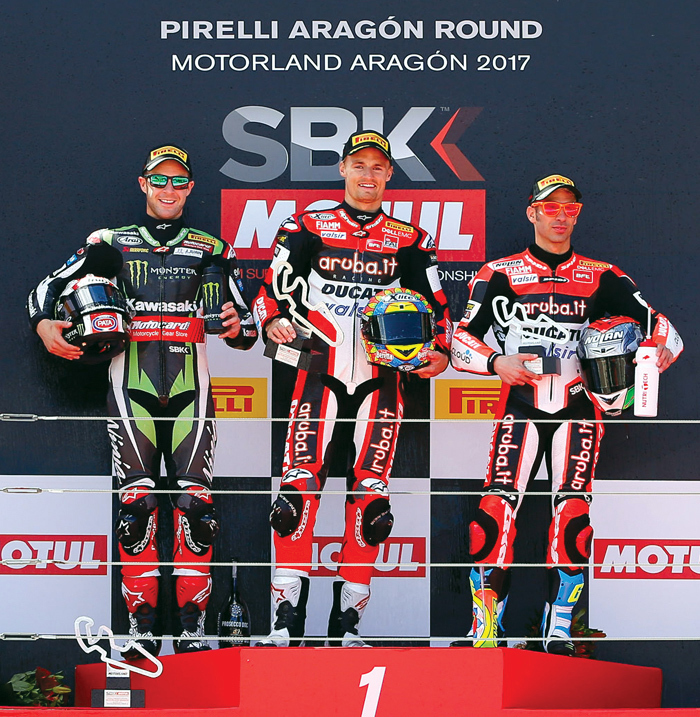 RACE ONE Saturday, April 1st 2017 - Following a brilliant 18 lap contest at the Pirelli Aragón Round Jonathan Rea (Kawasaki Racing Team) maintained his 100% record so far in 2017, taking full advantage of a late crash for Chaz Davies (Aruba.it Racing - Ducati), whilst Marco Melandri (Aruba.it Racing - Ducati) and Tom Sykes (Kawasaki Racing Team) completed the podium. 2nd - Marco Melandri (Aruba.it Racing - Ducati) "I was a very tough race because everyone expected to have warmer temperatures to use the softer rear tyre but this was impossible, everyone's bike were completely different to the practice and for me it was not easy. 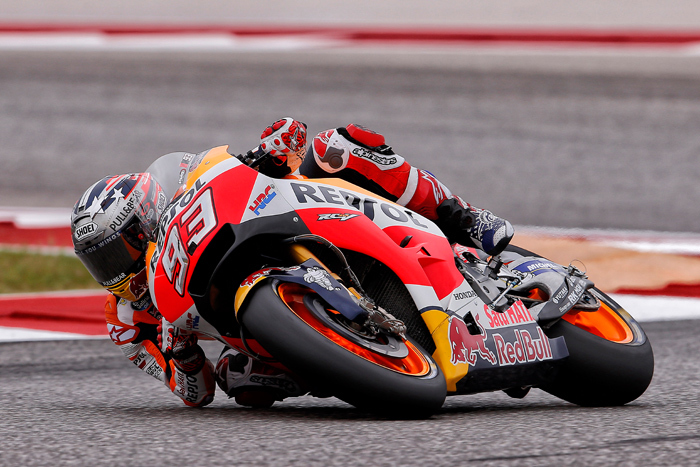 I couldn't have the speed that I would like to have and to be second is a big result for me." RACE TWO Sunday, April 1st 2017- A highly determined ride from Chaz Davies (Aruba.it Racing - Ducati) at the Pirelli Aragón Round on Sunday saw the Welshman get his first win of 2017, with Jonathan Rea (Kawasaki Racing Team) and Marco Melandri (Aruba.it Racing - Ducati) also on the podium. 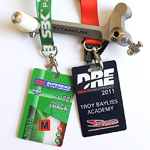 Alex Lowes had started Race 2 at the front of the grid and he had held the lead for several laps. The Englishman eventually finished 13th. 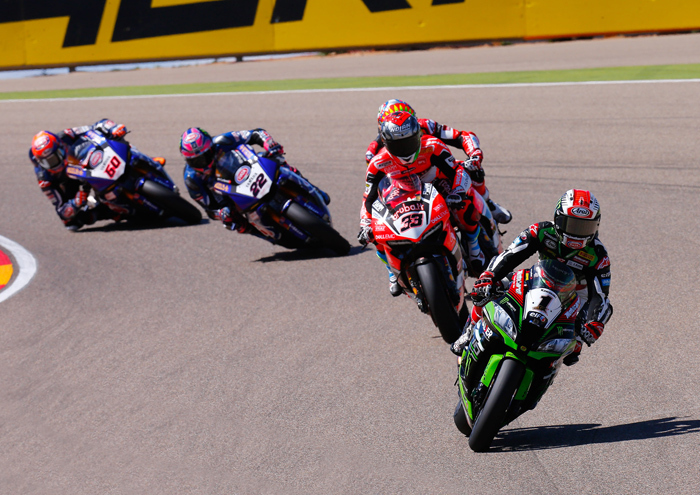 In sunny but windy conditions at MotorLand Aragon - went down to the last lap, with Davies making amends for his Race 1 crash as he got the better of World Champion Rea over the last two corners. The pair dueled for the lead in the final stages, with Davies ultimately crossing the line half a second ahead of Rea, to end the Northern Irishman’s five race winning streak. 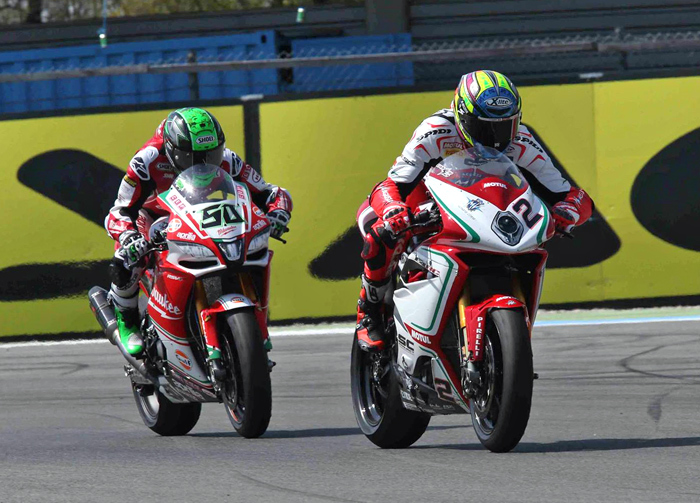 Melandri continued his solid comeback season in third place, around 2.5s back on his victorious teammate. Xavi Fores (BARNI Racing Team) recovered from the drama of his Saturday DNF, which saw his race end with his Ducati in flames, finishing Sunday’s contest as the top Spanish rider in sixth – just under two seconds ahead of compatriot Jordi Torres (Althea BMW Racing Team). 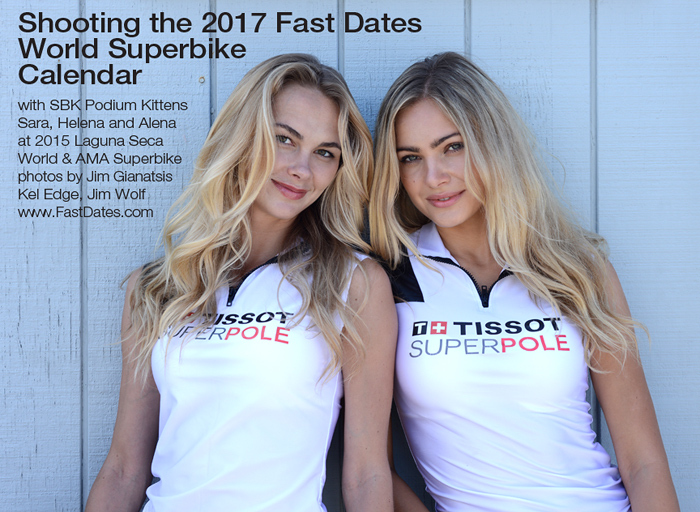 Leandro Mercado (IODARacing), Eugene Laverty (Milwaukee Aprilia) and Leon Camier (MV Agusta Reparto Corse) completed the top ten. 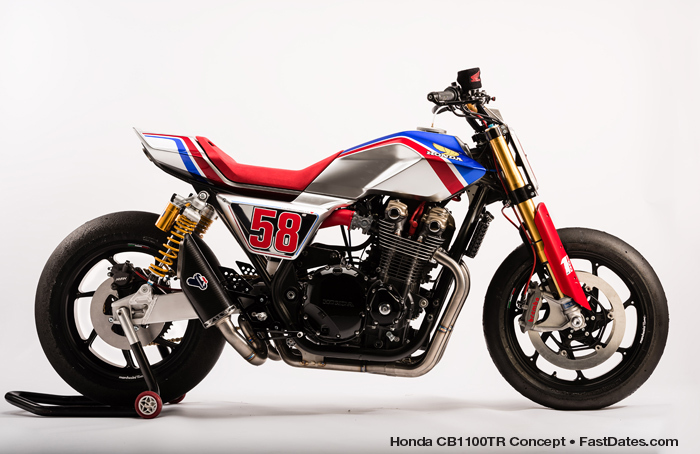 Nicky Hayden (Red Bull Honda World Superbike Team) suffered a DNF due to a technical problem, whilst Alex De Angelis (Pedercini Racing SC-Project) crashed out at the end of lap 15. 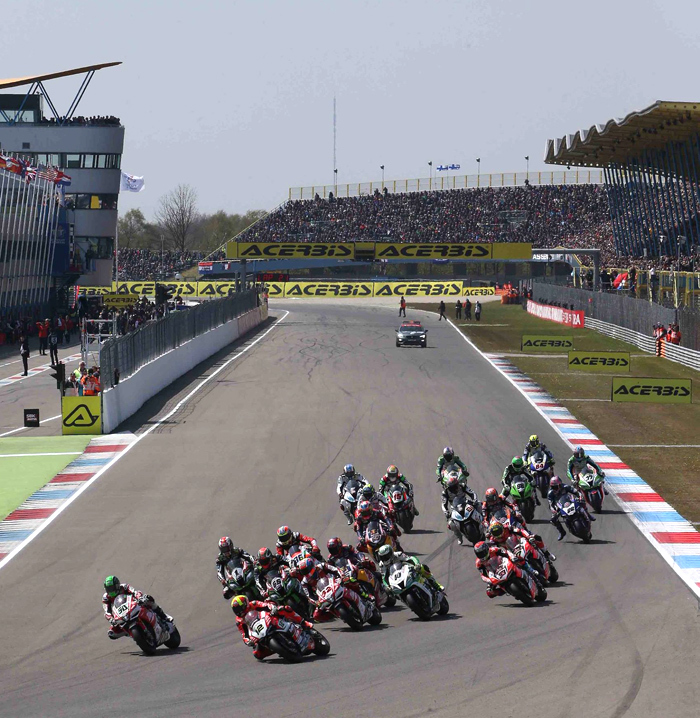 The WorldSBK grid will be back in action at the Acerbis Dutch Round over the28th-30th April weekend. 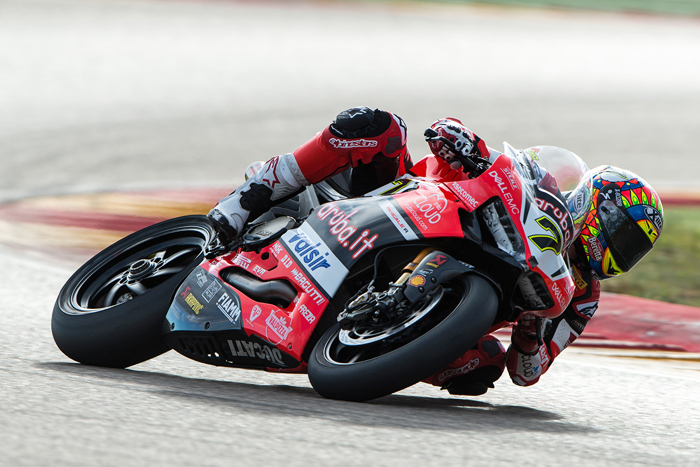 Chaz Davies was the first new face atop the podium this season in Aragon, bringing a hault to Jonthan Rea's 5-race winning streak, with Ducati team mate Marco Melandi in third.
" 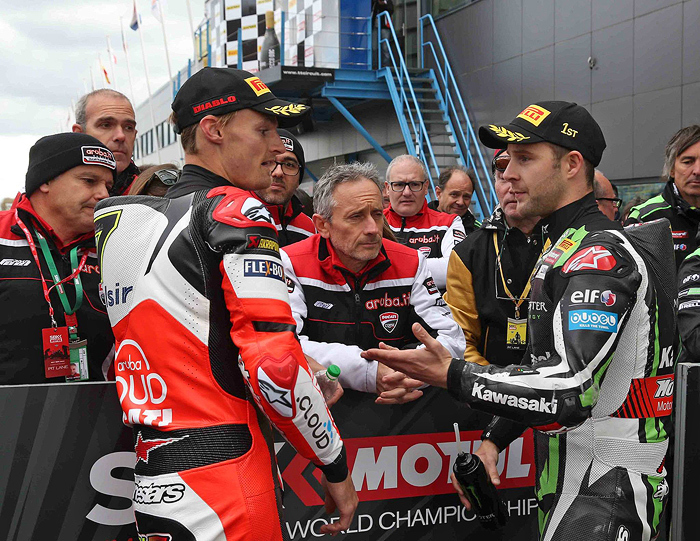 Now that the dust has settled on the Assen WSBK weekend I’d like to bring into context the events that unfolded during the Superpole session on Saturday afternoon. I don’t feel like all the facts were obvious at the time so I think it’s necessary to provide the full picture. Firstly, I hold my hands up and apologise for my choice of language. I’m sorry it came across on live TV and to whoever it may have offended. In the heat of the moment I went #nofilter. I realise us guys are role models for young kids and that was no example to follow. Whilst I’m sorry for my choice of language, I’m not sorry for addressing the issue in the way I did. I don’t need to detail that this sport is dangerous and there isn’t much more dangerous than a rider touring on the racing line. Add a touring rider into the path of other riders during the last lap of Superpole and it’s another level of #Sh*ts AboutToGetReal. Sorry, there I go again with the potty mouth 😏. I’ve added some context for you below, so the facts are there for all to see. Towards the end of Superpole 2, rider #65 set an incredible marker with his first lap on the new Pirelli qualifying tyres. These tyres aren’t exactly qualifying tyres, they’re called a pre-qualifying tyre and according to Pirelli should be “good for around 3 fast laps” rather than the typical 1 lap you’d usually see from a true qualifier. #65 rolled off the gas immediately after his first flying lap. That’s pretty normal when you know you’ve got everything out of your package, which, judging by his lap time, he seemingly did. I completed my first flying lap. The lap went OK, but I didn’t feel like I perfected it and I assumed it was probably not good enough for the front row of the grid. So I pushed on for another bite at the cherry with a second lap. I crossed the line at the end of my first flying lap, 19 seconds after #65 completed his lap. 19 seconds is quite a large gap. 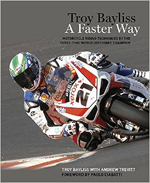 For example, a full lap of cruising is, on average, about 15 seconds slower than an on-pace lap. So for me to catch up the full 19 seconds in less than half a lap, is quite exceptional. Add to that the fact that #65’s slowest ‘pit in’ lap of the entire weekend was 18 seconds slower than a full on-pace lap (1'54 vs 1'36). Yet at the end of Superpole 2 somehow he managed to lose 19 seconds in the opening 40 seconds of a full 96 second lap. In Moto3, the percentage determined to be “cruising” is 10%. Applying Moto3 rules, losing just 4 seconds would have been enough for #65 to incur a grid penalty. I wonder what penalty would have been handed down for 19 seconds? My second lap was underway and at the second intermediate split I was 0.051 (51 thousandths of a second) outside of my previous lap, a gap that I would definitely call 'in touch’ to improve my own lap time. I saw #65 as I exited turn 5 onto the back straight, he took a long look over his shoulder through turn 6 and with that I expected him to move well aside on what is a seriously fast part of the circuit. As I threw my bike into into turn 7, #65 was mid corner, just wide of the ideal racing line. I’m talking a bikes width but no more, definitely far from off line. In that situation you don’t know what the rider ahead is thinking or which way he’s going as he hasn’t clearly shown which part of the track he’s heading for. He stayed on that line which then on corner exit turns into what is exactly the ideal line, where the natural line is to drift out to 3/4 track width before bringing it back to setup the entry for turn 8. I had already backed out of committing to turn 7 at the very last split second on corner entry as I could see what was about to unfold. That foresight and slight lack of commitment at the speed I was carrying gave me the time I needed to be able to pick the bike up on the early part of corner exit and give enough room to avoid what could have been a massive accident. #65 again looked behind, the opposite side to where I was and I felt the need to wake him up to the severity of what just happened. I hit him on the arm as I passed and hurtled some gestures his way. Fast forward a couple of minutes into parc ferme and once I saw #65 I made the Italian gesture of a pinched together thumb and fingers, translate - “what the hell were you thinking?”. I expected a different reaction to what came. #65 went straight on the defensive saying he hadn’t seen me, claiming he was off line anyway, why was I on the outside of him, I shouldn’t have been anywhere near him. It was a good attempt at turning the situation around to put the blame on me. There was everything but a simple apology, which, had it of arrived straight away, would had instantly diffused the situation. At that point I tried to put across the severity of the situation, but his arrogance was off the scale. I threw the regrettable profanities at him and finally, after heated exchanges, he begrudgingly offered his hand as an apology. As far as I was concerned it was too late and I didn’t feel like it was genuine so I declined. He was happy to tell the media that is was good to see me frustrated. If you get your kicks from putting other riders' lives in danger, good for you. My reaction was genuinely not informed by any kind of frustration other than at what I perceived as dirty riding. Race Direction took the matter into the own hands (without any intervention from me or my team) and decided that a 3 place grid penalty was sufficient. Quite honestly, I’d have preferred to see an immediate admission of fault over the penalty that was handed down. After the incident, another rider who was on his 'in lap’ and saw everything unfold confirmed exactly my thoughts that #65 was looking over his shoulder with intent from early in his in lap. At turn 5 it’s very easy to glance across the circuit to all the way through turns 2, 3 and 4 to see which riders are coming. #65 stayed well off the gas, taking another look over his shoulder during turn 6 (seconds before the incident) which unfortunately wasn’t broadcast on the replay, but it is shown on the full Superpole 2 session video on the WorldSBK website (20min 52secs into the full Superpole 2 session video). I saw this look behind on track and then again on the full video clip when I was called to Race Direction - it was clear for all of us to see. #65 knew I was coming and endangered both of us with his underhand games. Of course he will deny this, but the facts, video and Race Direction penalty prove otherwise. #65 knew I would abort my lap, but, if I had have committed to turn 7, there’s a strong chance neither of us would have made the grid. I’d expect fairer play from a novice, let alone a double World Champion. Mistakes happen, I’ve unintentionally held up others before and have always held my hands up to those kind of mistakes. However, with the facts that were in front of me, I’m absolutely certain there were no coincidences on this occasion. 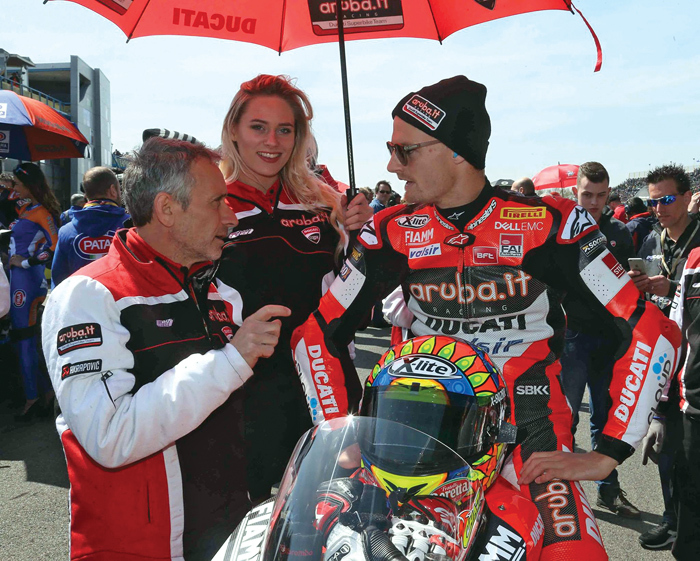 On track it's usually clear what is or isn't intentional, I had the same situation last year with my team mate Davide Giugliano in Thailand, but I recognised it as an honest mistake and he was quick to admit fault. A number of riders messaged me on Saturday to say they have, at various points in the past, had the same issues - if #65 sees you as a threat he's willing to play those cards. 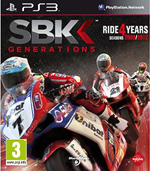 So, to #65 - you're a good enough rider without these games so cut the crap and lets continue to put on the show that is entertaining fans of Superbike, mano a mano. I enjoy the battles, the intense rivalry and hugely respect your ability/achievements, but I strongly believe on this occasion you just took it way too far. Let’s get back to old fashioned hard & fair racing at Imola. 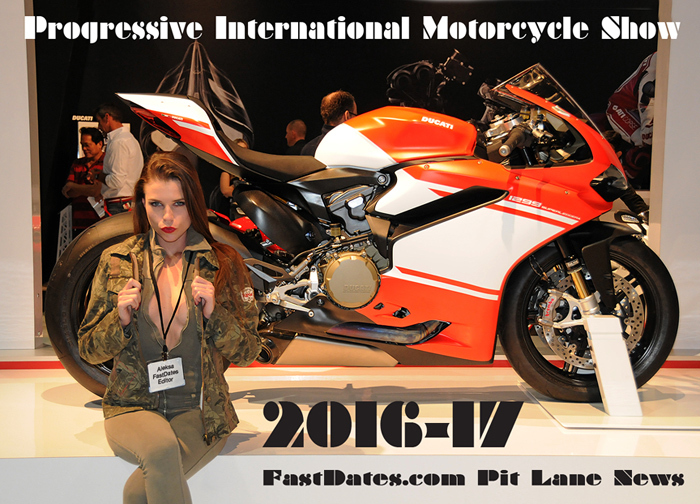 Motorcycle News, May 1st 2017- "What a weekend! I honestly can’t believe we have walked away with another 50 points after an incredible double in two very different races. I always get a warm feeling driving under the tunnel and into the paddock at Assen and it didn’t disappoint this year. Apparently the circuit attendance was well up on last year which was easy to see. 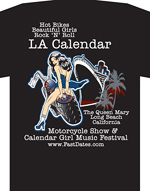 I always enjoy taking in the atmosphere there, especially around the Gert Timmer chicane area."